This tutorial will explain the best methods to fix Terrarium TV buffering. Terrarium TV is a great app for streaming Movies and TV Shows and usually works flawlessly. However, some Terrarium users do occasionally experience buffering issues. The methods below will show you the best ways to eliminate Terrarium TV Buffering quickly and effectively. The first method to fix buffering should be trying a different video player. Unfortunately, the integrated YesPlayer doesn’t seem to work very well but we can easily change video players within the application. I suggest using MX Player due to its speed and it also does a great job with subtitles which I demonstrate in the video below. The second method requires integrating Real-Debrid within Terrarium which is an unrestricted downloading service. The third method is to use a VPN which will avoid Internet throttling imposed by your Internet Service Provider and mask your identity when using Terrarium TV. TROYPOINT Tip: You should always use a VPN to protect your identity and security when streaming free movies and TV shows with apps such as this. Legal Copyright Disclaimer: This technology shall only be used to stream movies or TV shows that fall under the public domain. 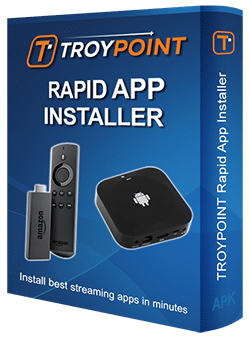 TROYPOINT does not endorse or promote illegal activity tied to streaming or downloading copyrighted works. Referenced applications/addons are not hosted by TROYPOINT and this guide is for educational purposes only. One important thing to also remember about Terrarium TV is that buffering may be occurring because your ISP is throttling the internet connection. 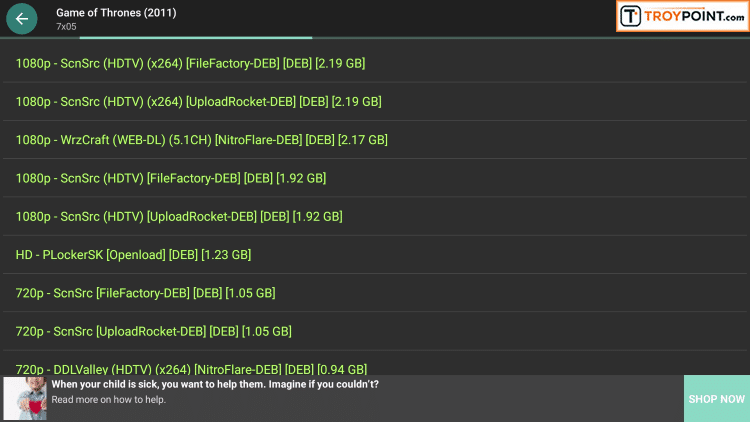 ISP’s or Internet Service Providers are able to see what you are streaming and may be slowing down your connection when using services like Terrarium. That is why TROYPOINT recommends installing a VPN on your streaming devices. Below, you will find a tutorial on how to switch your video player to MX Player. Important Note! If you experience loss of audio, change to HW+ decoder in MX Player settings. Another technique I have provided for fixing Terrarium TV buffering includes registering for and installing real-debrid. 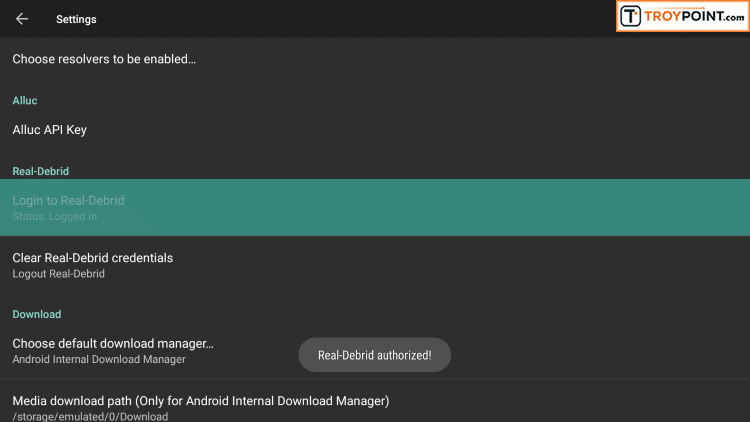 Real-Debrid is an unrestricted downloader that stores files and allows for streaming onto preferred devices. Integrating real-debrid into your Terrarium TV will add more Movie & TV streams to go along with the ones pre-installed. Real-Debrid is free with a membership from 6 a.m. to 12 p.m. and requires a paid membership for any time after that. Premium memberships cost approximately $5/month. Important Note: Prior to going through the Real-Debrid tutorial below, you must deactivate your VPN. 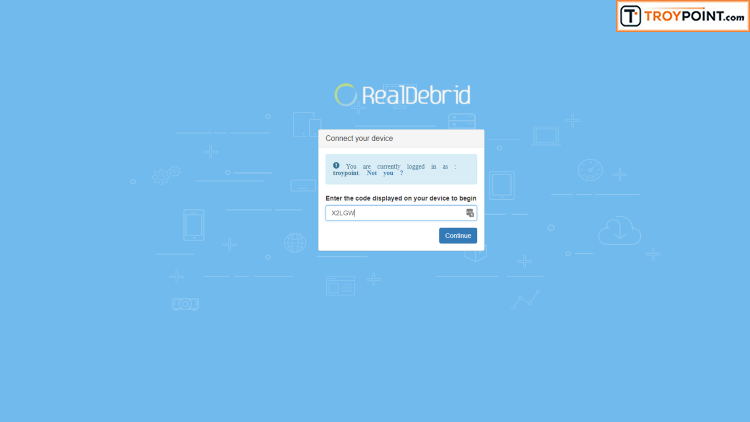 Once you have paired the Real-Debrid service with your device, you may turn your VPN back on. 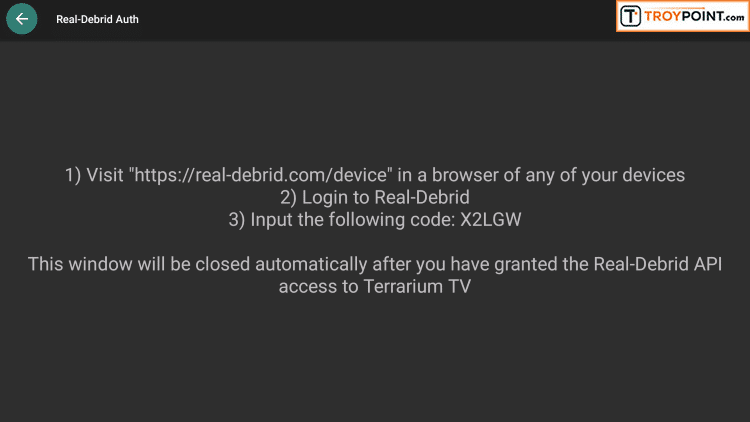 Use the steps provided below to install Real-Debrid within Terrarium TV. 2. Open Terrarium TV and Click Menu (3 horizontal lines) in upper left hand corner. 5. Make a note of code shown on the screen. 6.– Go to https://real-debrid.com/device and insert code from previous step. Click Continue. 7. – Real-Debrid authorized message will prompt on your device’s screen. 8. – You will now have access to additional video sources identified in green font with the abbreviation [DEB] – that should provide buffer free streams. Hi, I am having a problem with getting about 15 to 30 or more of the same links. Can we do anything about this? I am also having a problem with buffering, I have changed players but still having the problem. I do have a debrid acct and a vpn on or off I still have the same problems. I’m getting links but non of them will play, any ideas please Troy? Hi Chris, try restarting your router and Fire TV. Unplug each from power for a few minutes and then plug back in. Also, Real-Debrid provides many more high quality links which this guide goes into as well. Is anyone else having problems with “NO SOUND from mx player? Hi Steve, right now I am working on a video tutorial for this problem. For now, choose a different link or choose ExoPlayer for those links. This is a decoder problem within MX Player and please check back here soon for new video on this. Thanks. See new video above on how to fix sound issues in Terrarium TV. I cannot see the video to fix Terrarium sound issues. You need a codec pack for it. I have changed my player to MX, I have a debrid account, and I purchased a VPN, IP Vanish to be certain. I am still experiencing buffering upon playback and it is very annoying. Is there anything that can be done to fix this issue? Please advise. Thank you. Have you tested your internet speed? What device are you using? Make sure in the settings on network, next to notifications that your signal strength is very good. Just a suggestion. Hello Troy, I installed mxplayer but when i open it i get a message saying (The purchase history of this product cannot be found). When i click ok Amazon tells me that this app is trying to direct me to an external market place and i cant continue after that. What can i do? Hi Jane, go into Fire TV Settings / Application / Manage Applications / MX Player and uninstall it. Then reinstall through Downloader with my shortcode troypoint.com/mx When you open Terrarium after that, go into Settings and set MX Player as default video player. Have you notice a huge loss in sources on terrarium and the ones that do work are constantly buffering? Terrarium has not been updated since May. Hoping for an update soon! Yes, I have noticed this, too. I think there are just too few sources now and too many people trying to access them. I’ve tried MX player – no difference, VPN – no difference. I’ve tried free Real Debrid in the mornings – no difference. Same with Kodi and its addons. Hi Michael, when this happens, I usually try a different source. Or, I just use ExoPlayer which is the built-in video player for Terrarium TV.